Heh, my mom sent this to me, it was funny. 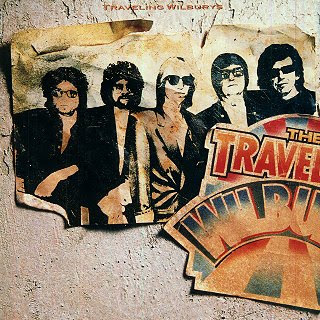 The Traveling Wilburys consist of Bob Dylan, Jeff Lynn, Tom Petty, the late Roy Orbuson, and the late George Harrison. The made two cds together in the early to mid 1990's, and well they were really just having fun and goofing off. But. . .they one a grammy for their first cd, so they made another on called volume 3, fuuny they skipped number two. Heh, ironic. Anyways, they re-released the two together and a DVD about them as well. Of course I bought it. Hey, Wow it's been a really long time since I wrote last, . . . sorry about that. Heh, since I haven't had Internet at home, I really haven't been doing a whole lot of computer stuff. Anyways, Went camping this past weekend with Tom, it was a lot of fun, we went to the States Straights Park in Upper Michigan. It was cool, I got to take Tom to Clydes finally, and the Mystery Spot. Heh, I'll up load some pics later.